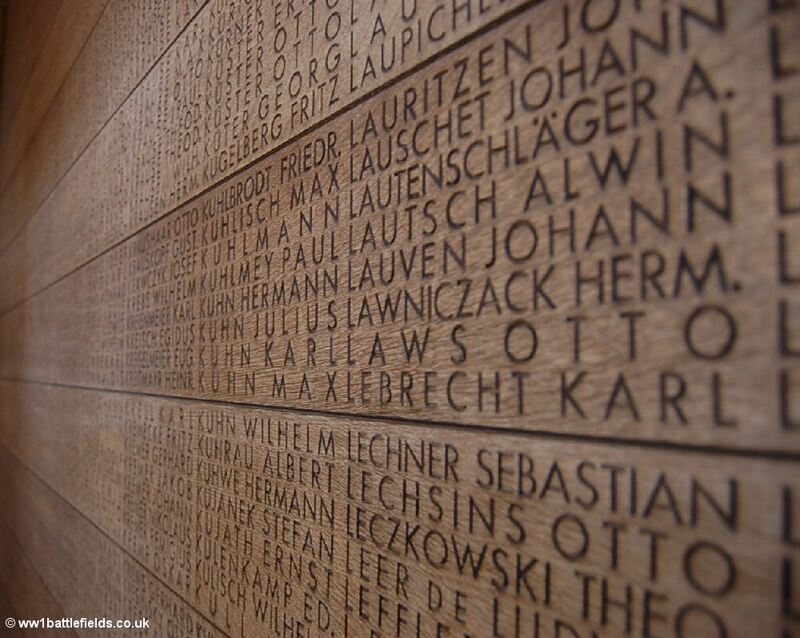 Langemark is about four miles north-east of Ypres. 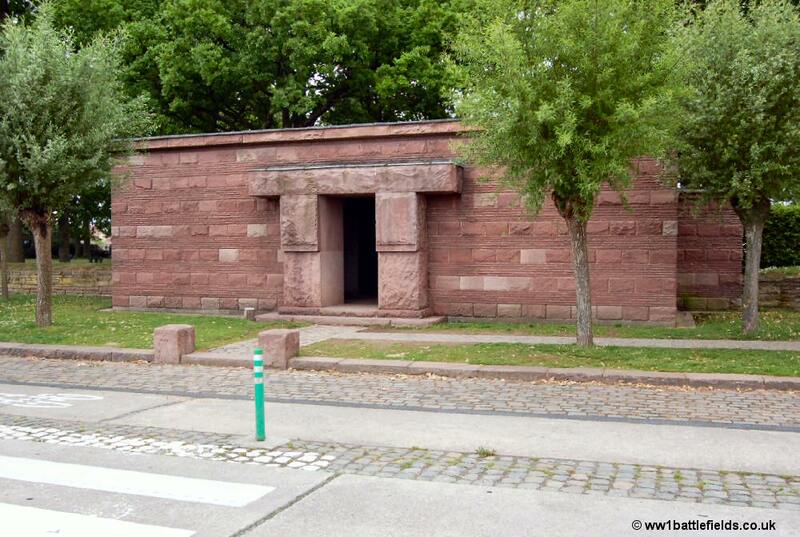 Two significant Great War sites near the village are the Brooding Soldier and the German war cemetery. 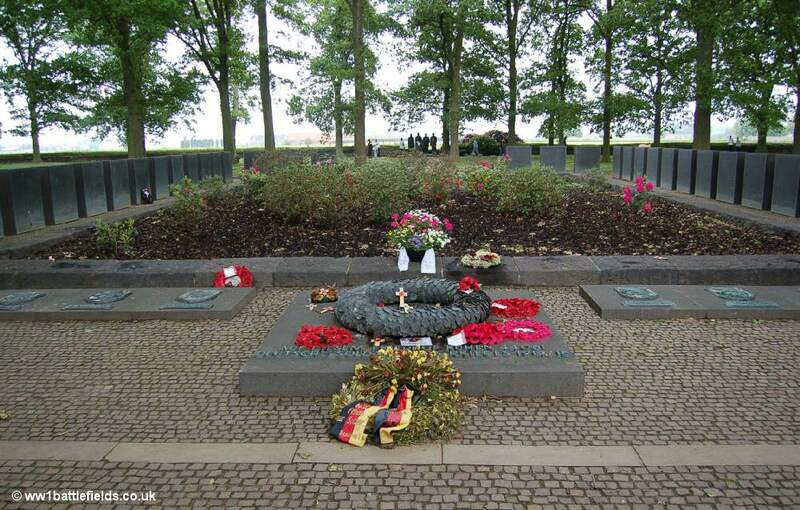 Both are covered on this page, as well as other sites of interest in and near Langemark (also known as Langemarck). 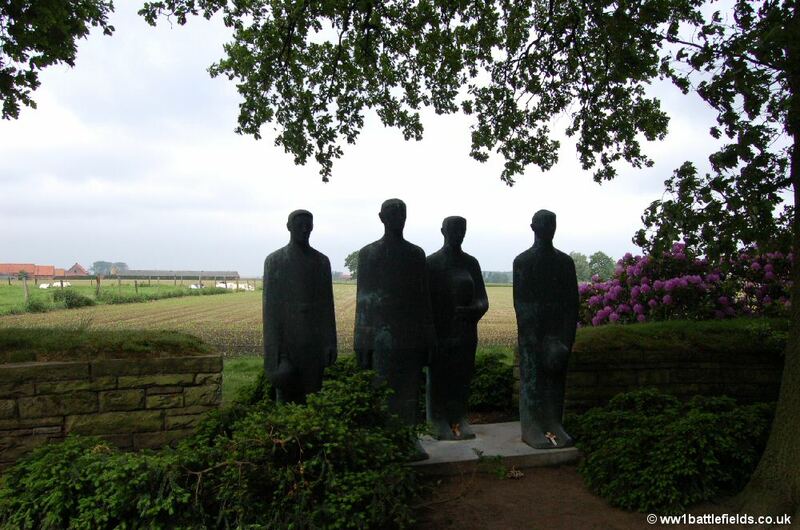 It was near the village of Langemark on the 22nd of April 1915 that the Germans first used poison gas. They advanced around two miles towards Ypres following this use of gas. Whilst deploring this awful atrocity, the Allies did not take long to employ this weapon themselves, at Loos just five months later. Canadian troops were among those affected badly by the gas, and around 2000 Canadians died in this attack. 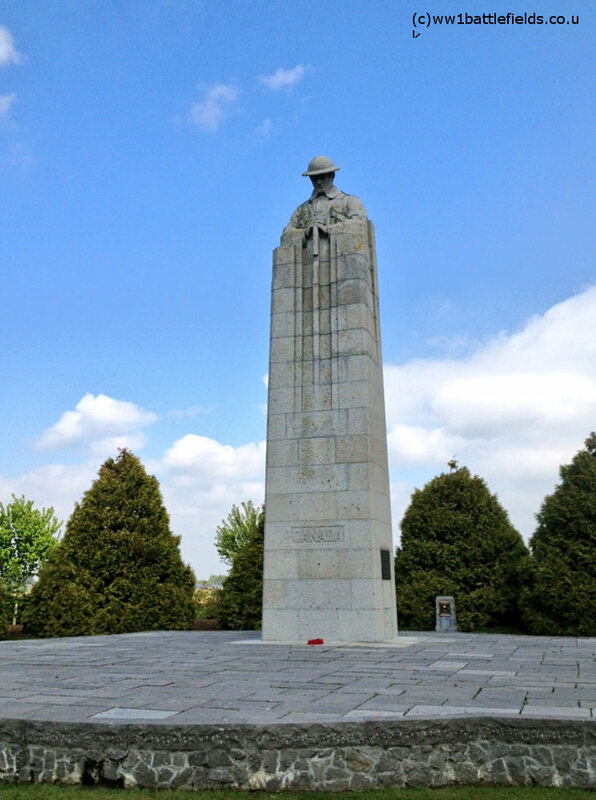 At a location known as Vancouver Corner, which is about a mile south-east of Langemark where Zonnebekestraat meets the N313, is the Canadian ‘Brooding Soldier’ Memorial. There are several parking spaces by the memorial for battlefield visitors. 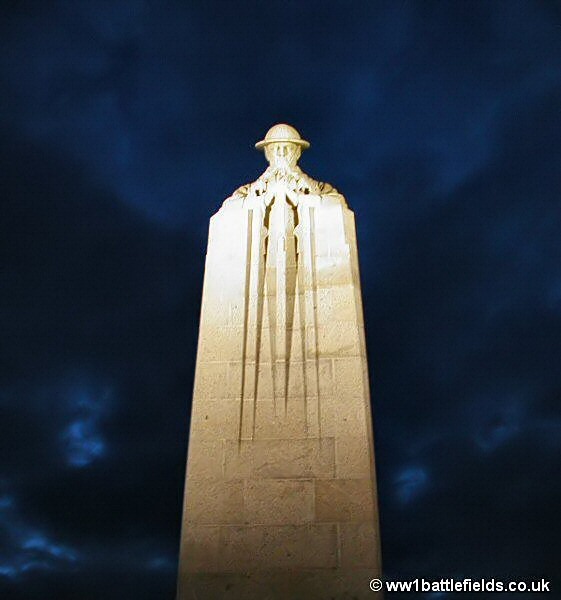 The imposing statue of the Brooding Soldier is a memorial to those who were affected by this first use of chlorine gas during the Great War. 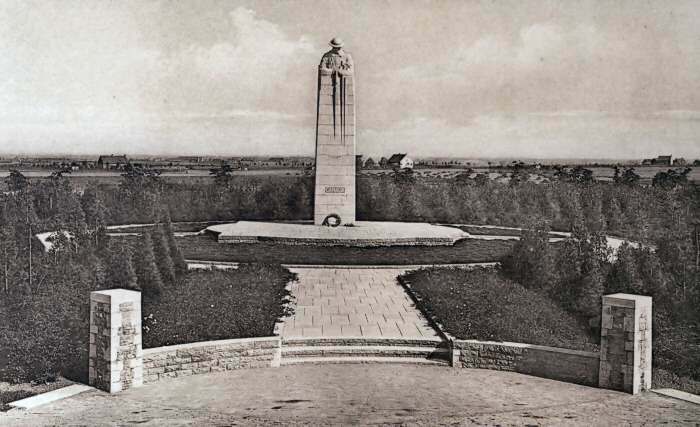 The design was runner-up when designs were considered for the main Canadian memorial at Vimy Ridge. 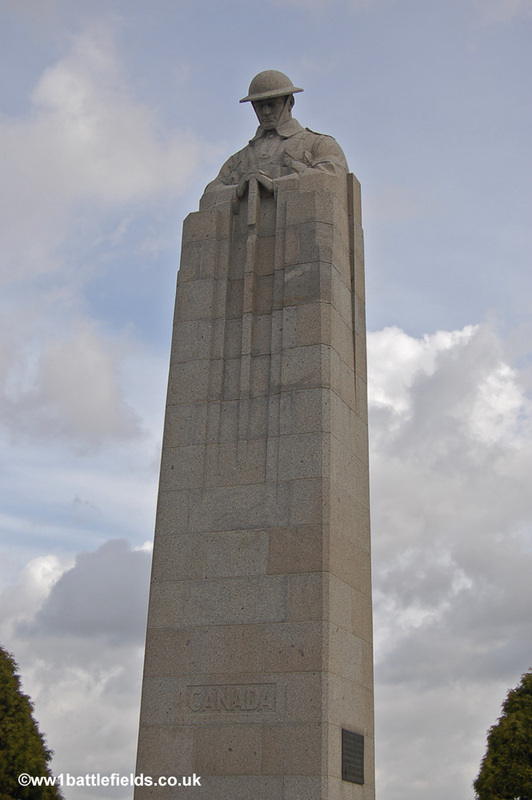 Due to costs a simpler memorial was used at other significant Canadian sites on the Western Front, such as that at Crest Farm at Passchendaele. The memorial stands in quite a large area, and the floral displays can be stunning . In autumn the area is often covered by red flowers. At the base of the monument is an inscription commemorating the Canadian soldiers. Set in the paving stones around are directional arrows pointing to various sites on the battlefield – including Langemark. 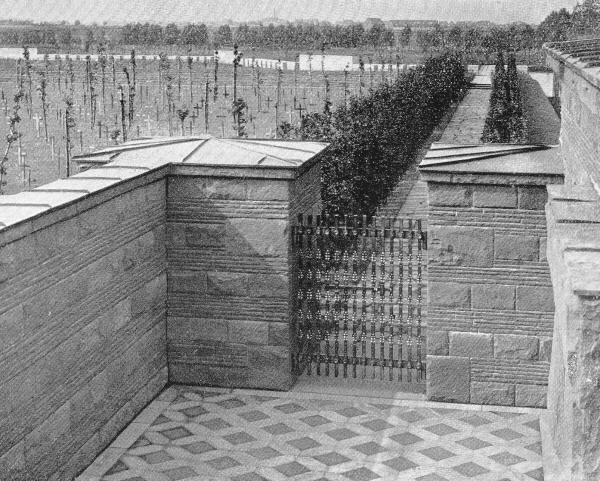 There are large glasshouses situated behind the memorial site today, so it is not in such an isolated spot as it was originally (see the photo below). 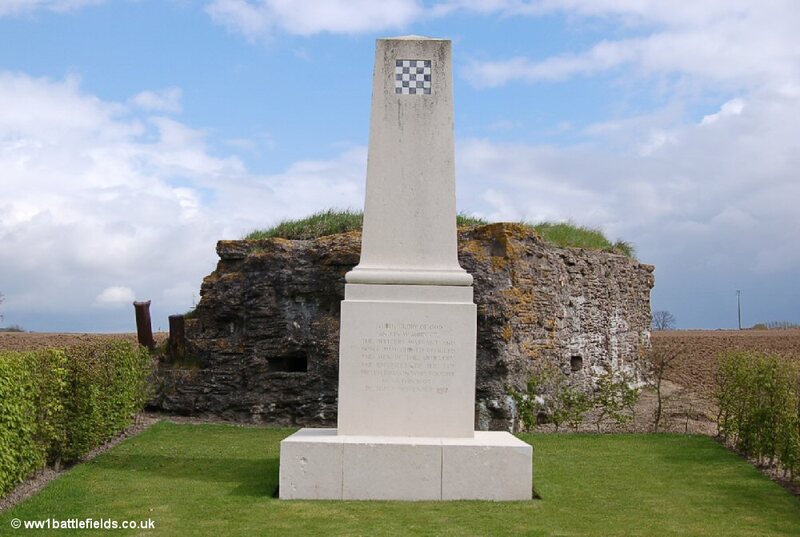 The memorial was unveiled on July the 9th, 1923 by the Duke of Connaught, with Marshal Foch, the Earl of Ypres (Sir John French) and the High Commissioner for Canada also in attendance. Lieutenant-General Sir Richard Turner VC spoke at the ceremony about the feats of the Canadians here in ensuring that the line did not break. 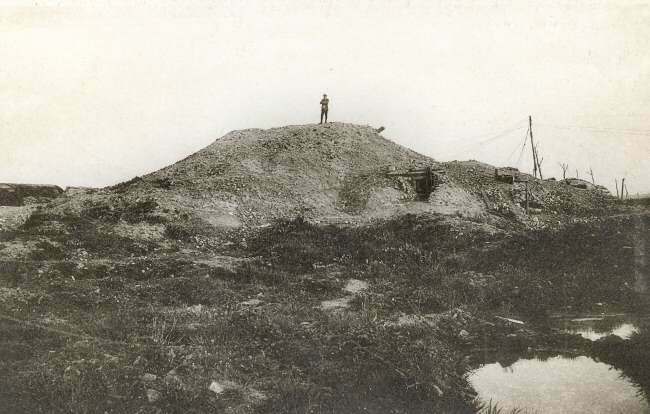 Despite their efforts however, the Germans made significant advances in this attack, and the picture below shows captured British trenches in April 1915, which would be around the time of the gas attack. 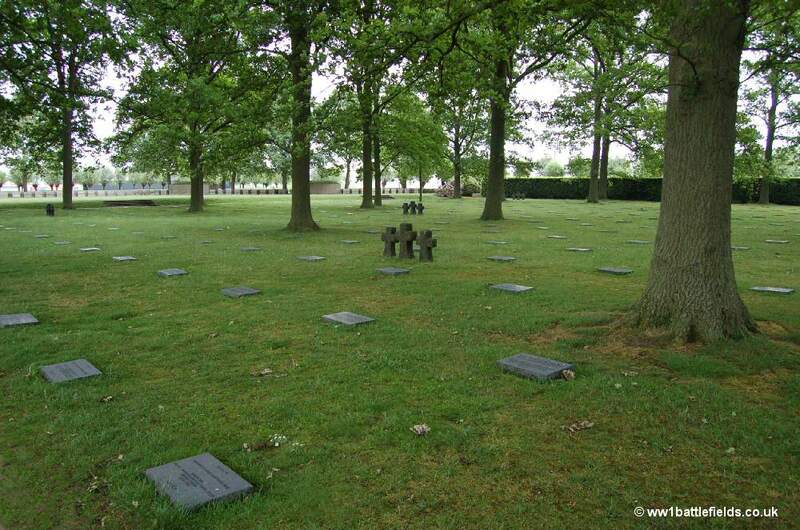 Just north of Langemark village on Klerkenstraat is the sombre Langemark German Cemetery. There are relatively few German cemeteries on the Western Front battlefields. As they had invaded, the land that France and Belgium was prepared to grant them was limited, in comparison to their British allies. Although this cemetery is much smaller in area than Tyne Cot, in fact it has many more burials. This is because the burials are effectively in the form of several mass graves, although there are headstones (which are laid flat to the ground) as well. There are also occasional clusters of small crosses, but these are not grave markers. A car park is located on the left past the cemetery. 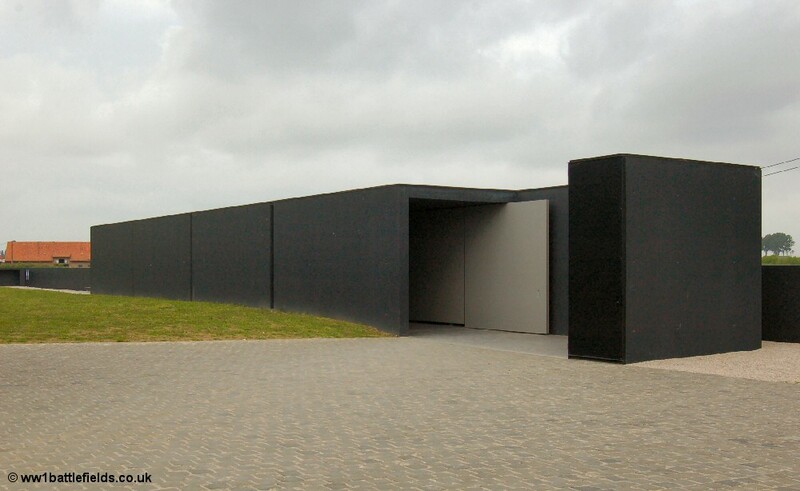 The route from the car park leads along a gravel walkway into a black tunnel like structure in which there are audiovisual presentations. The first presentation runs on a single television screen, whilst the next are each shown on two screens. They show images of the area before the war, aerial footage of it today with specific sites marked and shown on the ground. There are also views of early postcards of the cemetery with crosses, and then later picture showing it looking rather overgrown. Once you reach the end of this walkway, a cobbled pathway lined with pollarded trees runs beside the road to the cemetery entrance. On entering, there are chambers to the left and right. In the left chamber there is a map of area, with Langemark and the cemetery marked. On the walls of the chamber to the right are lists of names (see left hand photo below). On entering the cemetery itself there is an inscription on a flat stone with a sculpted wreath (centre photo above). This records that 44,061 men are buried here. Ahead is the mass grave of nearly 25,000 men. The names of those known to be buried here are recorded on eighty-six upright bronze panels beyond this entrance (right photo above). 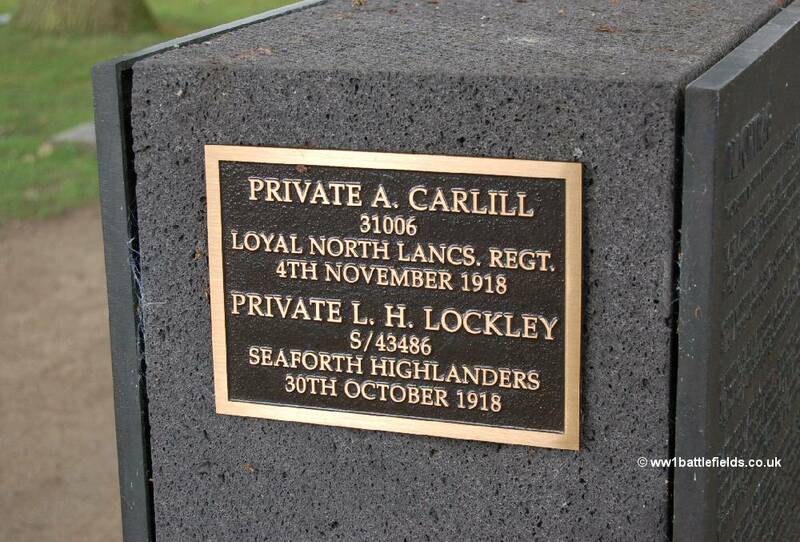 Just to the left of this central inscription, on the edge of the first of the upright bronze panels is a plaque commemorating two British soldiers: Privates Albert Carlill (Loyal North Lancs) and Leonard Lockley (Seaforth Highlanders). Both these men died late in 1918. Carlill died as a prisoner of war aged 19, just a week before the end of the war. Both originally had commemorations in CWGC cemeteries (Carlill at nearby Cement House Cemetery – see later on this page), but recently they were officially recognised as being among those buried here at the German Cemetery, and so the plaque (left photo below) was put in place in 2005. At the rear of the cemetery is a sculpture of four stone soldiers, watching over the graves. Somehow, this cemetery (and the German Cemetery at Fricourt on the Somme) is a more forbidding and perhaps a grimmer reminder of the war than most British and Commonwealth Cemeteries, which tend to use light stone in their construction and for their grave markers. 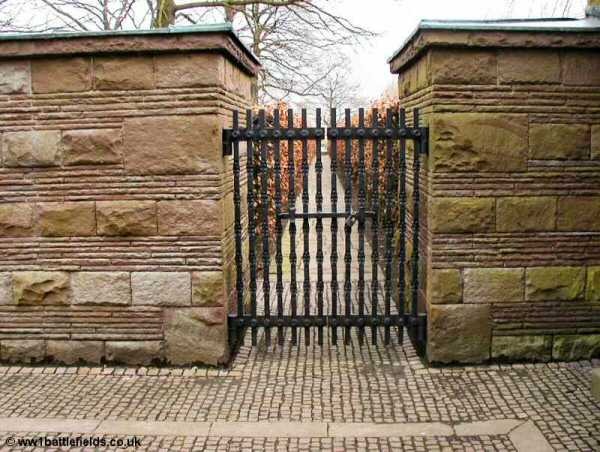 The front of the cemetery has iron gates to paths leading along the front of the cemetery. An old picture from the 1930s can be compared with a similar view today. There were many crosses here at that time. Within the cemetery are the remains of three concrete blockhouses. These were captured in October 1917, and behind these and the memorial blocks between them (which can be clearly seen in the lower photograph below) lie nearly 9,500 more German soldiers. These sites (which are located together) are reached by turning left out of the German cemetery car park and then left again after 200 yards, by a white house and a culvert. In the fields to the right of this small road (Beekstraat) the white memorial can be seen in front of the bunker. This is a memorial to the Artillery and Engineers of the 34th Division. 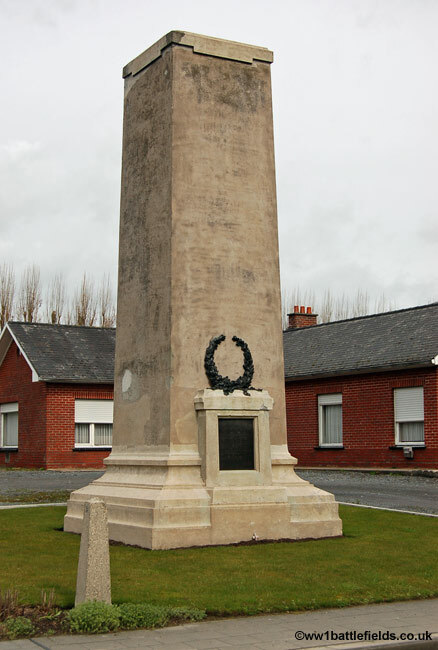 The inscription states “To the Glory of God and in memory of the officers, warrant and non-commissioned officers and men of the Artillery and Engineers of the 34th British Division“. 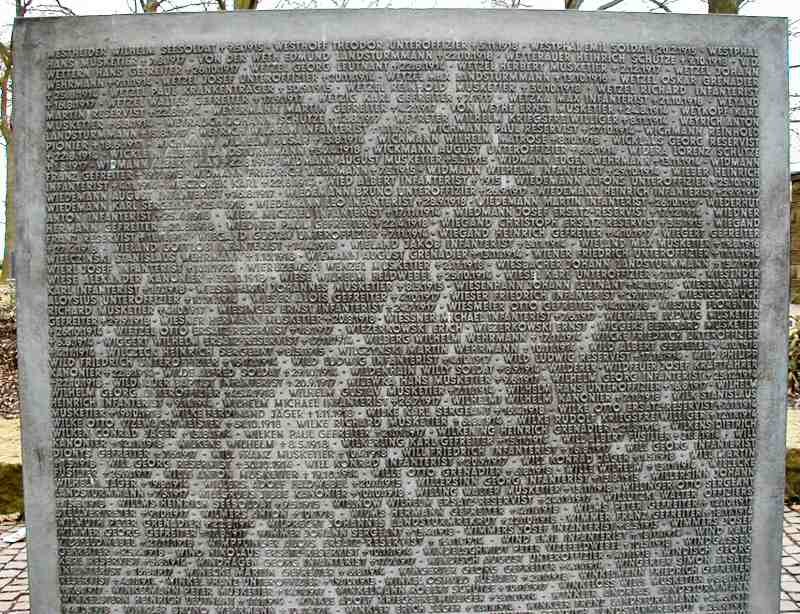 On the sides are inscribed the names of the units, including Divisional engineers, Pioneers, Northumberland Fusiliers and artillery units, specifically from October and November 1917. 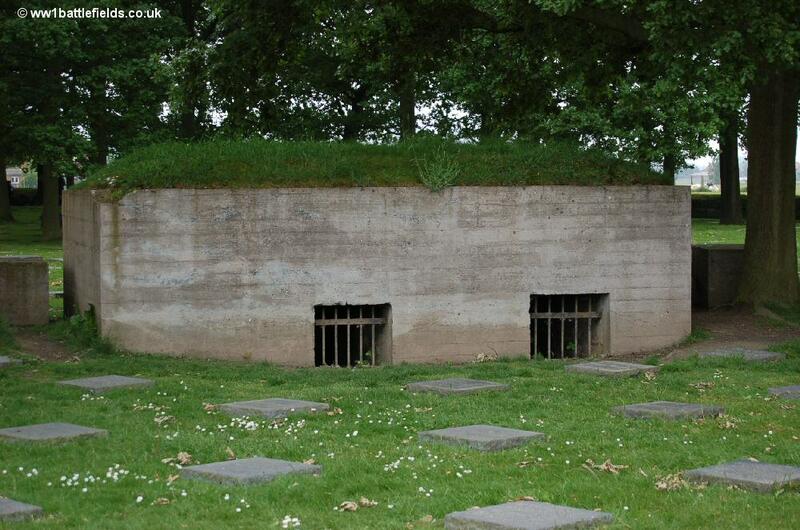 The bunker is directly behind the memorial, and its massive and strong construction can clearly be seen from the iron bars set within the concrete (right hand photo above). Parking can be difficult here depending on the time of year. It is exposed, and the winds can be bitter. IN winter and spring the conditions can be incredibly muddy; the soft mud quickly sticks to your boots until your feet feel twice as heavy as normal. It gives perhaps the smallest inkling of what the bitter mid-winters in December and January, or the cloying mud in spring after rain might have been like – but the true grim reality of living in the trenches in the cold and the mud remains thankfully almost unimaginable for us today. Langemark, like other villages in the area, as well as Ypres, still has cobbled streets. 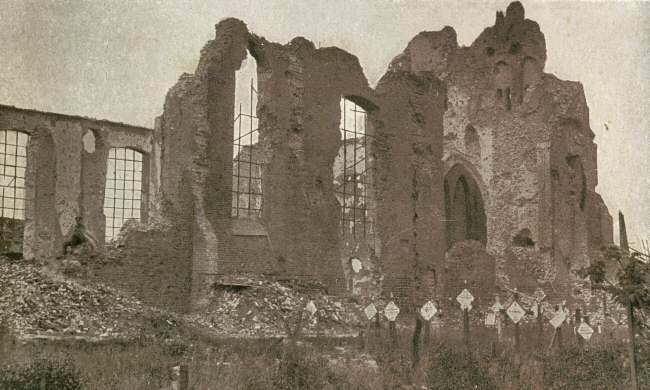 The village itself had been largely destroyed by May 1915, and an information board by the church also shows several pictures of the village and the church in ruins. 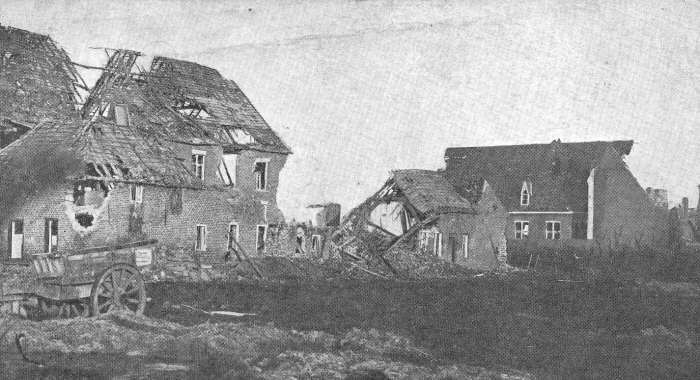 During the Third Ypres offensive the village was taken by the Allies on the 16th of August 1917. It was to change hands two more times before the War ended. 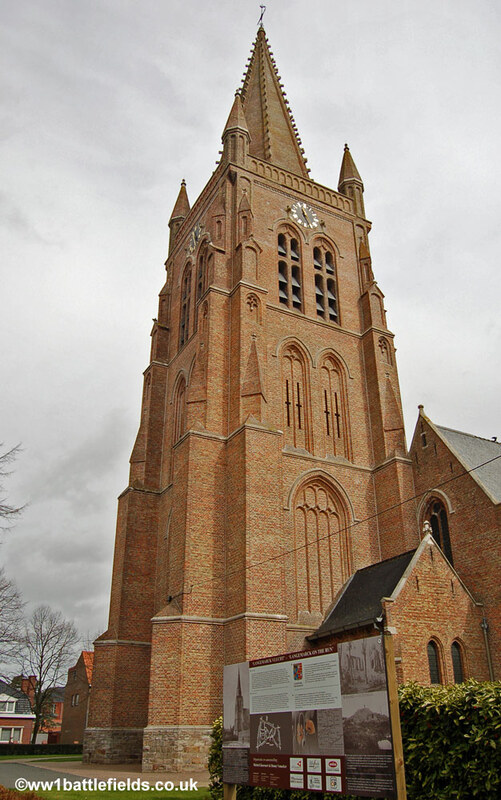 The rebuilt village church is in the centre of Langemark, with parking spaces around it. Standing beside the church are information boards, with details of the church, which has been destroyed several times over the centuries, including in 1798. The photos below show it damaged early in the war (and also war graves can be seen in the foreground), in ruins later in the war, and rebuilt as it is today. 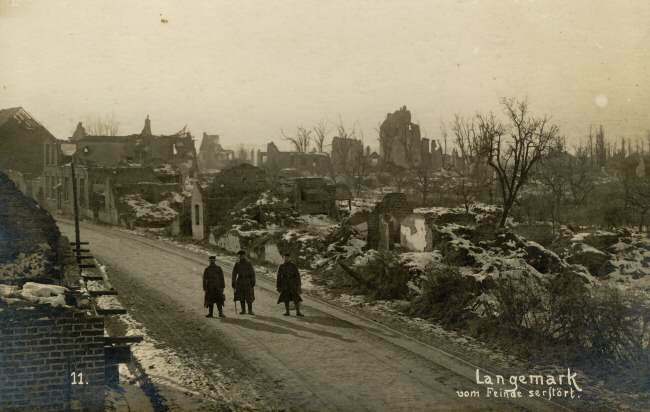 The site of Langemarck church later in the War. Photo: NELS. Heading south west out of Langemark on Boezingestraat, on the right hand side of the road is a memorial to the 20th Light Division. New housing has now encroached almost all around the memorial, as can be seen on the modern photograph, when compared to the one below right from the 1930s. At that time, the memorial stood in open fields. Early in the morning of the 16th of August, 1917, the 60th and 61st Brigades of the 20th Division crossed the Steenbeek – a small river just a little further along this road – by temporary bridges covered with canvas to muffle their footsteps. An artillery barrage started at 4.45 a.m., and the infantry attacked whilst the barrage “crept” forwards. They took a German strongpoint known as Au Bon Gite, and although the ground was in a dreadful state (the 20th Divisional History calls it “nothing but a swampy crater field”) they took the village and the station. During this action, Private Wilfred Edwards of the 7th KOYLI and Sergeant Edward Cooper of the 12th KRRC won Victoria Crosses, in both cases for advancing with little concern for their own safety on concrete strongpoints that were resisting the infantry advance. The final objective was reached by 8.00 a.m., although the Germans counterattacked in the afternoon, pushing the 20th Division troops back a little. 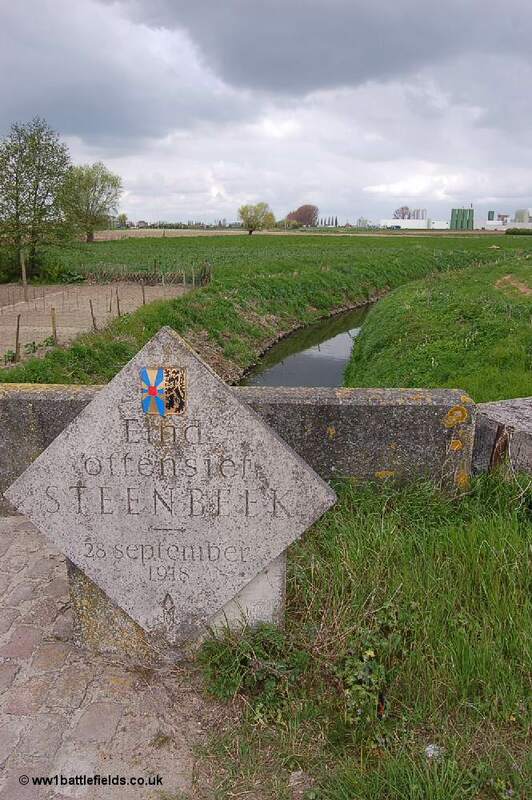 A little after the memorial the road crosses the Steenbeek, mentioned earlier. 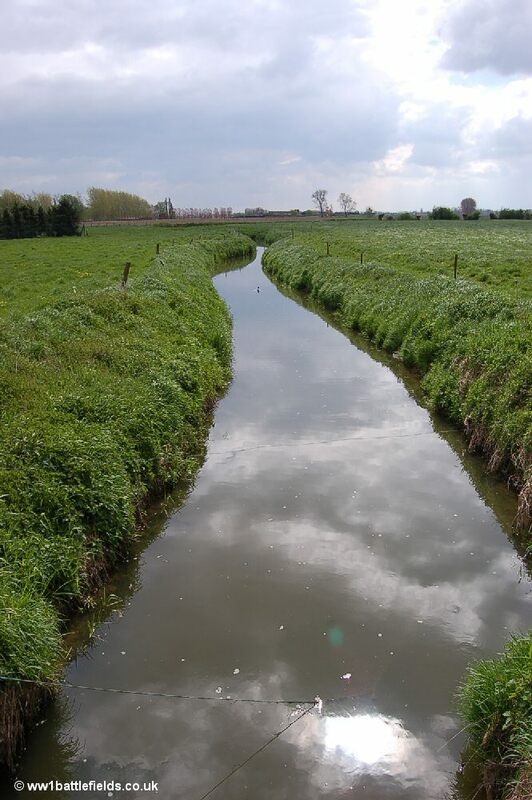 This small river was well known to the soldiers who fought in the Salient. There is an Albertina Marker here, marking the end of the Steenbeek Offensive in September 1918. Continuing along this road and leaving Langemark, a large cemetery is located on the left side of the road after about a third of a mile. This is Cement House Cemetery. 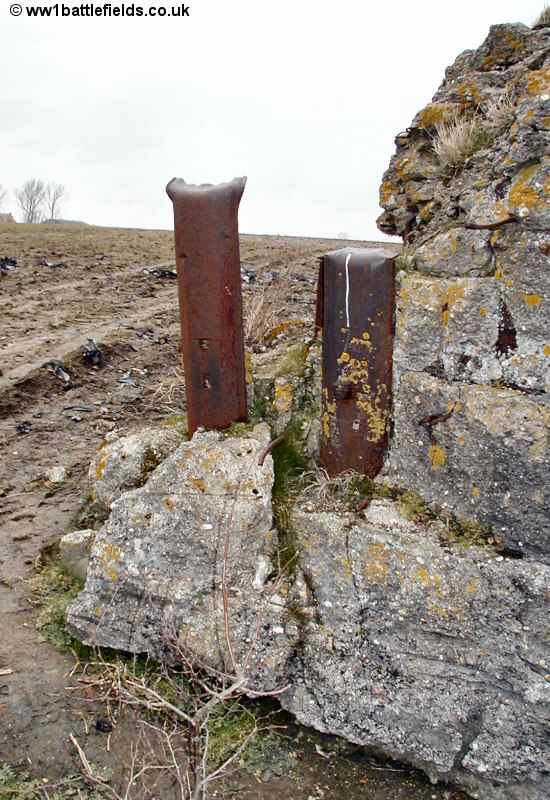 Cement House was the name of a fortified farm building on the Langemark to Boezinge road. The cemetery was begun at the end of August 1917 by the 4th and 17th Divisions, and these 231 burials which continued until April 1918 now make up plot I, an unevenly spaced group of graves located on the left hand side of the cemetery. Row K in this original part of the Cemetery is interesting, in that it consists of one long row of headstones very close together, in fact many touching. Some of the headstones have two names on, and almost all the burials date from 12th – 20th October 1917. Soldiers buried in this row are from various units, including the Tyneside Irish, 20th Hussars and Royal Field Artillery, but this has the look of a mass grave, and I wonder what the story behind it is. 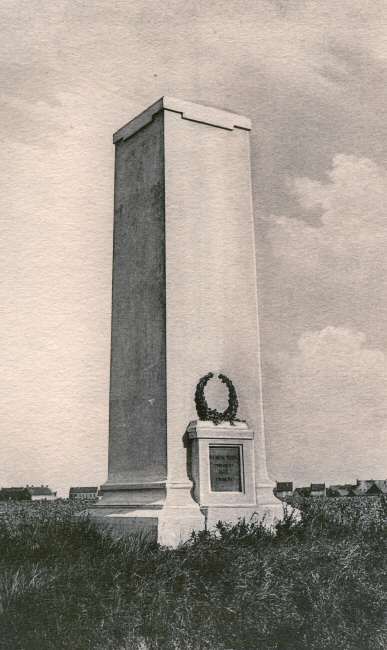 After the Armistice, other plots were created by the concentration of small burial grounds around Langemark and Poelcapelle. Nearly five hundred French graves were removed in 1922, and the space created then used for further additions. 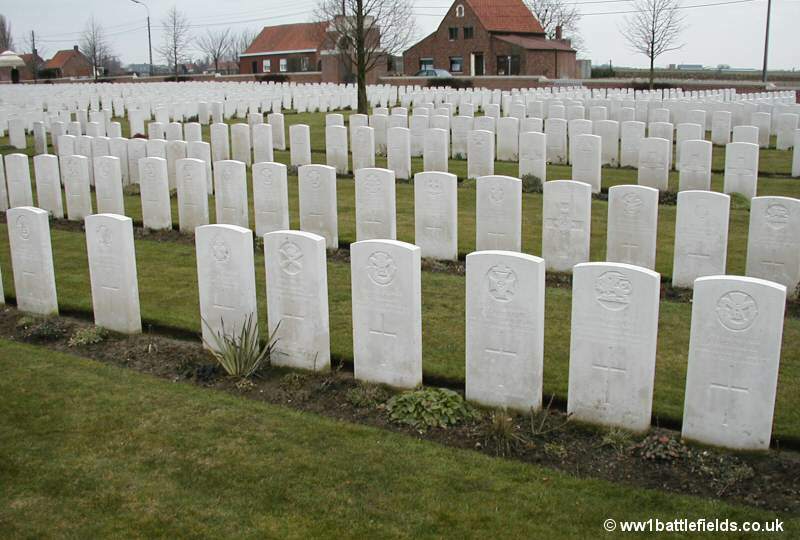 There are now 3576 Great War burials here, of which 2408 (two thirds) are unidentified. There are a small number of Second World War burials here too. This cemetery is actually still in use today, occasionally for concentrations of graves which have to be moved from other locations for various reasons, and also it is where the remains of soldiers who continue to be found in the region are buried. 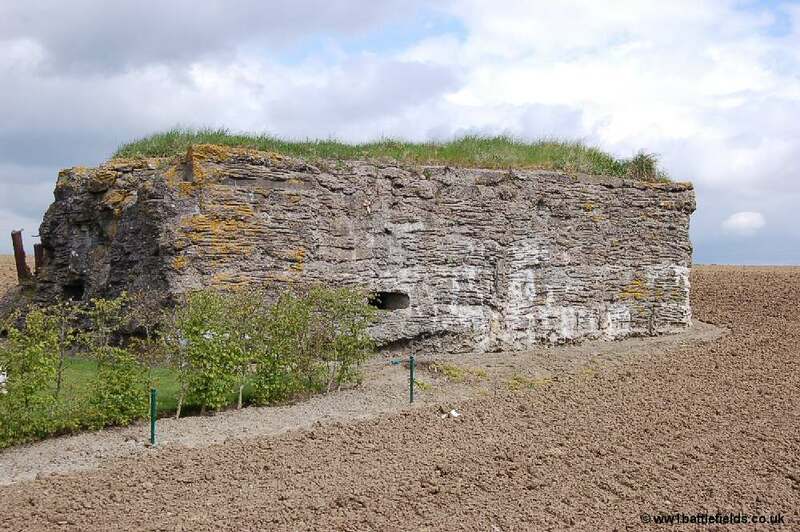 There have been a number of burials at Cement House of the remains of soldiers found by the Diggers (a group of Belgian amateur archaeologists) during their battlefield excavations. 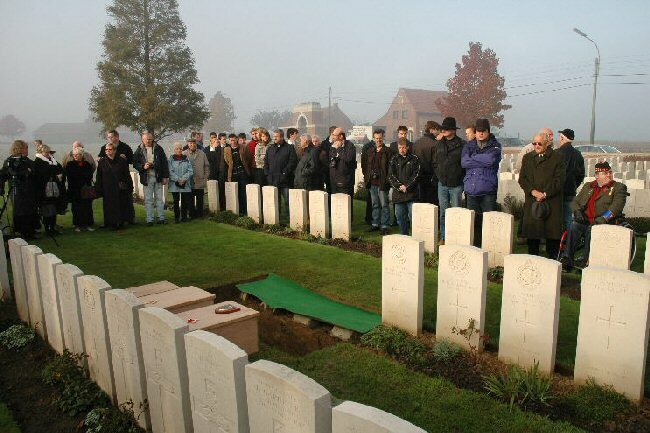 On the 14th of November 2005 the burials took place here of three soldiers whose remains were found at Boezinge. The picture below shows the caskets at the cemetery before this ceremony. Located about half a mile east of Vancouver Corner (reached by following the small road to the south-east past the glasshouses and then turning left) is a mill. This is a structure that was rebuilt after the War in the early 1920s, but the original mill here was given the name Totemuhle or ‘Death Mill’ by the Germans who used it as an observation post. On the road that leads from Langemark to Boesinghe, just before reaching Pilkem is a bar called De Sportman at a small crossroads. Located on the wall of a brick building opposite the bar is a plaque to the Welsh poet, Hedd Wyn. The Welsh flag flies just above the plaque. Hedd Wyn’s real name was Ellis Humphrey Evans, and he served as a Private in the 15th Battalion of the Royal Welsh Fusiliers. 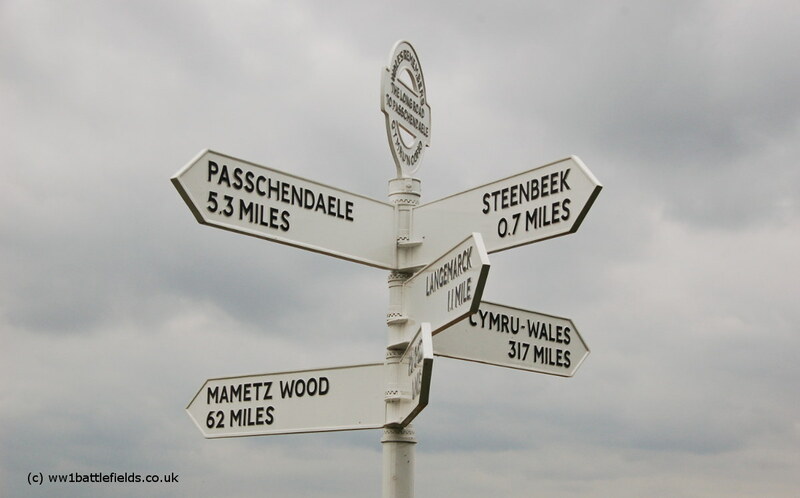 The plaque gives more information in three languages: Welsh, English and Flemish. 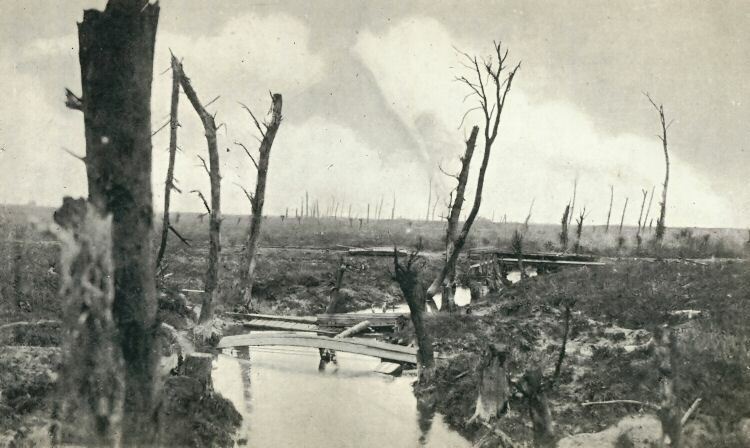 Evans was mortally wounded near this cross-roads on the 31st of July 1917 – the first day of the Battle of Passchendaele. Just over a month later he was posthumously awarded the major Welsh poetry prize – the Chair of the National Eisteddfod. He is buried west of here at Artillery Wood Cemetery in Boesinghe. The plaque was erected on the 31st of July 1992. Just after the cross roads, still heading towards Boesinghe and agin on the left is a new addition, the Welsh Memorial Park. There is a large flagpole with the Welsh flag visible from a distance; the park was created in 2014. There is a pull in area in front of the park, with space for several cars. 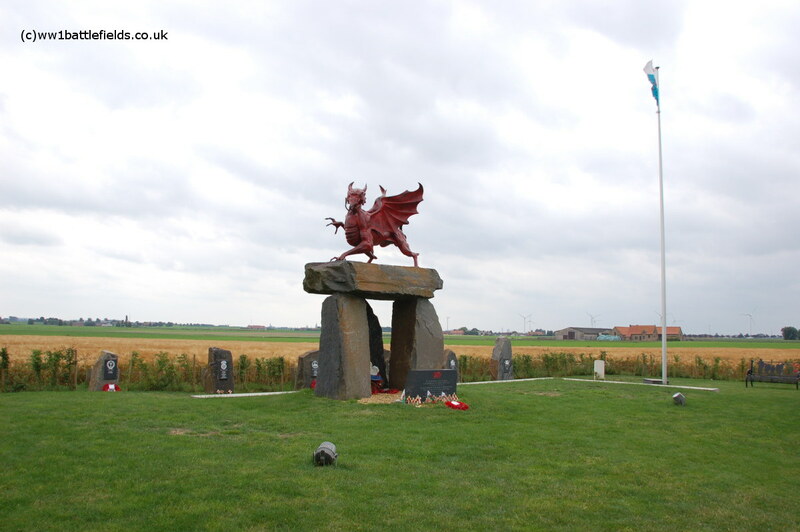 An information board stands to the front left of the park; the main memorial is a megalith with three base stones and a top lintel stone, on which stands a fiery red Welsh Dragon. To the right of the park are benches and a signpost pointing to relevant spots where the Welsh fought, as well as to Wales itself. Standing stones at the rear of the park show each Welsh Regiment and where they fought.